Just the other day I was watching a movie called The Five-Year Engagement. 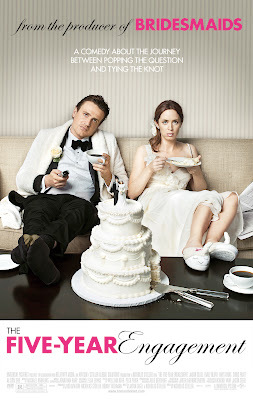 You can't ever go wrong with Jason Segal and Emily Blunt. "The worst choice you can make, is no choice at all". This line really struck a chord in me because of some choices I recently had to make. I am the worst decision-maker in the world. Indecisiveness and I are very much well-acquainted. Only recently did I learn to make crucial decisions of my own (mostly because I was forced to). Choices are never easy. Why? Because I'm a thinker and a realist. I know that whatever choices I make will affect everything and everyone in my life. I know that I have to live with the choices that I make. I know that choices are never right or wrong, but merely choices. If there are no right or wrong choices, why are they so hard to make? Because only ONE choice can be made. For so long I was in a rut, drifting by each day with forced enthusiasm and petty conversations. Feeling burdened by so many choices that must be made, I often seek isolation as an easy way to avoid confrontation. Other times, impulsive shopping with girlfriends seems to be a better option. Whatever it is, THE choice has already been made. Sometimes all I feel is regret, but I know that it is for the greater good. Maybe some day I would change my mind. After all, there is always room for changes in life. You just gotta keep an open mind. OMG, I was watching "The 5-year engagement" two days ago & I told My friends about the same Quote and I was searching it up in google when Ur Blog bumped in my Face and Ur whole analysis .. U're just describing me ... !